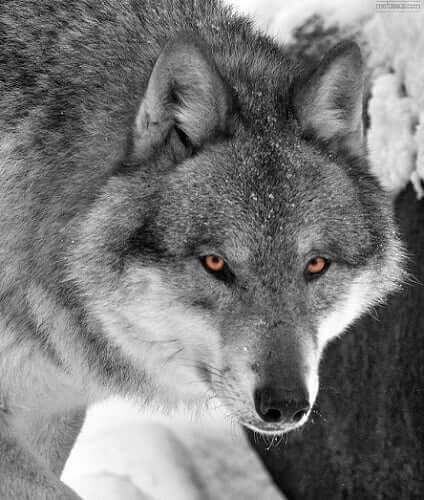 Many people recognize the beneficial properties of the wolf medicine. Let’s be clear: this medicine is of the spiritual, not physical nature. The Native American elders in particular held many beliefs about the symbolic nature of the wolf animal totem and its teachings, which they have spread down their lineage for ages. Wolves, they noticed, have many similarities to humans and their behavior. Like humans, wolves live in communal structures. These structures are lead with a specific, strict social order. At the top are the alpha male and female, followed by the betas. The beta wolves do not breed, but rather serve as the carers of the pups in the pack. The omega wolf, unfortunately, sits at the bottom, baring the brunt of all bad situations. When food is scarce, the omega does not eat. This may not sound like human nature, at all. However, it makes more sense in the grand scheme of things. Wolves teach us that all things in nature (and thus, our lives) have order, even in the most chaotic and traumatic circumstances. It is up to you to decide which role you will take in your own life: leadership, second in command, or scapegoat. Hopefully, you will recognize that only you can be the leader of yourself and that you should do so with humility, grace, and wisdom. According to the Native Americans, the spirit of the wolf (its medicine for our own spirits) teaches us that we must maintain the necessary balance in our lives. This balance consists of personal needs as well as those of our family, friends, and community. Wolves are one-hundred percent committed and loyal to their pack, showing us that we should never allow petty things to come between us and those we care about. Find your function within your family and communities and bring forth your best traits for the benefit of the group. A wolf symbol’s presence in your life may also be a sign that you should bring about a better balance to these communities and to yourself. Additionally, wolves also hunt in packs, taking turns or “tag teaming”. For humans, this serves as a reminder that cooperation is always the key in achieving common goals. The wolf creatures also have excellent methods of communicating with each other both vocally and non-verbally. When using their voices, wolves possess a variety of growls, yelps, whines, and howls that make up a complex and thorough system of communication. Movements of tail and ear, posture, eyes movements, scratching and expressions on their faces are also used for communication. The language that they speak with one another helps the pack to identify and locate its members, in addition to giving instructions, requesting assistance, and teaching the young wolf pups. It also helps to bring about a general sense of cohesion and unity. This quite clearly applies to human life, as well. Communication is key for our relationships to survive and thrive. Additionally, we mustn’t forget the importance of having proper communication with ourselves internally. How can we know how to proceed with our lives if we don’t? The Native American elders wisely taught us that when a wolf enters our psyche (whether during the day or in slumber), we must view it as a fortunate reminder of the state of the communications in our lives. Our ability to communicate is not limited to speaking and gesturing. It can be expressed with dance, song, and rituals, as well. By contrast, a lone wolf spirit guide symbolizes a completely different aspect of life. Although wolves are typically found in packs, you may encounter a single one in the wild. This speaks to us of the importance of freedom. While community and family are important, we must never forget to nourish our own bodies and souls. This type of wolf asks you to acquire your own sense of self and to nurture it. Know your own personal boundaries and do not be afraid to state them. Just as the primal, piercing howl of the wolf marks its boundaries, so, too, should you. Stand your ground when you need to. There is a time and place for everything. Wolves do not fight needlessly and avoid it when possible, reserving their stamina and strength for necessary times. The language of the wolf can speak to us in many ways. Its lunar tendencies reflect the same energies in us and call out to our emotions. By allowing its medicine to infiltrate our bodies and minds, we can see more clearly and connect with the life forces around us.